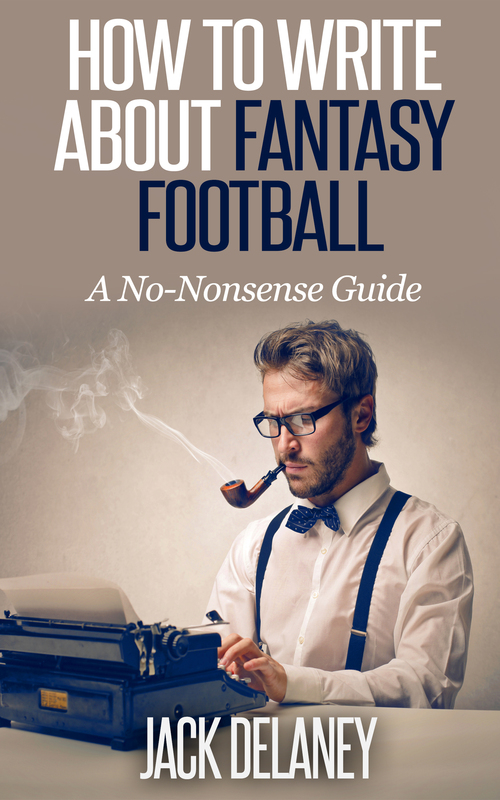 Continuing on my journey to help those in the fantasy football community, I have just released my first Ebook, “How To Write About Fantasy Football: A No-Nonsense Guide”. It can seem overwhelming and intimidating to write about fantasy football, but you don’t need permission to start your own blog or website. From writing exercises to creating content, I have created a guide that will help you focus on what is important when you first start writing. I can’t put in the work and effort for you, but I can show you how to reach your own goals and find your own version of success. Let 2014 be the year you stop wishing to start your own blog about fantasy football. Bonus: When you purchase “How To Write About Fantasy Football: A No-Nonsense Guide”, I will give you a free and thorough consultation of the blog or website you create. Congratulations on starting the blog! From what I read it seems like you know your stuff. I like that you hit on the subject of drafting a proven player compared to a rookie, as fantasy players can often overreach for a rookie when a better option is on the board. My suggestion in doing an article like this would have been to break it down into separate articles that cover each position and provide one or two sentences on why you ranked a player where you did. I would have done a QB article, RB article, and maybe combine WR and TE together and maybe defense and kickers together. For instance, I would be interested to know why you ranked Tom Brady ahead of Cam Newton. Do you not like the fact that Cam lost Steve Smith and has a lack of weapons? Does his ankle surgery worry you? Is Brady still a reliable option at his age? What will happen if Gronk and Amendola get hurt again? I think you would benefit from my Ebook, and when you send proof of receipt to coachjack @ yourfantasyfootballcoach.com, I am offering a free consultation which would include a very in-depth look t your blog and what you can do to take it to the next level. Great start though and keep up the good work! Thanks a lot! That was much appreciated. When I had initially composed the article I had highlighted, in different colors, players of significance. When I copied into wordpress the colors did not translate. On the other hand, you made a good point in breaking down players by position with arguments for or against those players. I would have to agree as that would prove to be a bit more useful than pretty colors. With that said, I have players by position articles in the works. This was my first article and attempt at blogging, so I appreciate the feedback. My rankings will probably change 100 times before it actually comes time to draft anyway. Regardless, thanks again, and have fun this season!